The successful APEC Summit in Vladivostok sets the tone for Russia to become a bigger player in the Asia-Pacific, both politically and economically. Twenty billion dollars is a lot of money for hosting the annual summit meeting of a regional grouping. CNN estimated that to be the amount Russia spent into transforming Vladivostok for the APEC summit meeting last weekend. Indeed, a lot of that spending indeed went into infrastructure development of the remote eastern Primorsky Krai region, including the brand-new US$1 billion causeway connecting Vladivostok with the Russky Island, where the summit was held. But in the final analysis, it was less a splurge and more a political statement of intent. And it was a statement in three parts. One, Moscow recognises the Asia-Pacific to be the “most important factor for the successful future” of Russia and the development of Siberia and the Far East, as President Vladimir Putin wrote in an article last week in the Wall Street Journal. Russia is taking a momentous decision to put more weight on its efforts to becoming an intrinsic part of the dynamic Asia-Pacific region. This is a tremendously important decision because Russia is a European nation historically and culturally, its trade is mostly with Europe, its population centres are in the “European part” and its policies prioritised integration with Europe. Two, emanating out of the above, as Putin explained, Moscow hopes that the Eurasia Economic Union that is taking shape will “play an active part in the regional and international agenda… [with] a significant role in global development agenda and become a bridge between the European Union and the Asia-Pacific region.” Russia believes that it is ideally placed to present an integration project with a unique a “transport profile” that will diversify the trade routes. The experts of the APEC Business Advisory Council estimate that traffic flow between Europe and the Asia-Pacific region via Russia’s territory will increase five-fold or more by 2020. Apart from being cost-effective, the Russian trade route has immense geopolitical significance, since it offers an alternative to the traditional transportation routes through the Straits of Malacca and the Suez Canal. Finally, the summit meeting at Vladivostok coincides with Russia’s formal entry into the multilateral trading system, which will bring greater momentum to trade and investment between Russia and the world economies. Russia is the last major economy to enter the world trading system. With the accession to the World Trade Organization, Russia’s trade policies and regulations gain in transparency and the accent will be on trade-liberalisation measures. Whereas Russia’s general tariff rate stood at 10 percent last year, the WTO protocol demand their lowering to 7.8 percent; the tariff for agricultural products are expected to drop to 10.8 percent from the current 13.2 percent. Adjustments are needed immediately in the import-export tariffs for one-third of Russia’s traded goods. Needless to say, the WTO membership compels Russia to promote industrial reform and accelerate the formation of a transparent and open market environment. At Vladivostok, Russia showcased its WTO membership. Putin called the summit a complete success. He said there has been a strong commitment to free trade and integration. True, a list of 54 green technology goods was finalized which would draw import duties not exceeding 15 percent by 2015; China announced a stimulus plan of US$ 157 billion in infrastructure projects; Russia agreed to remove restrictions on export of its farm produce; China successfully campaigned for a 10 percent improvement in the efficiency of industrial supply chains by 2015. The Russian diplomacy ensured two things. First, the focus was kept on the issues of economic cooperation. Indeed, the Japanese prime minister didn’t hold the customary “bilaterals” with the Chinese and South Korean leaders and Russia and the US publicly disagreed on Syria. Yet, the final message from Vladivostok was that Asia-Pacific is the economic engine of a fragile world economy. Second, Russia made a conscious effort to harmonise its Asia-Pacific strategy with China. 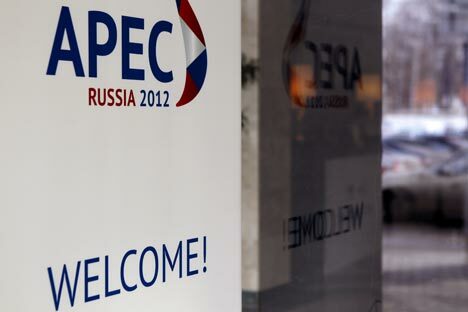 Russia doubtless estimated that APEC has been a key factor in the US’ “pivot” to Asia. In the 2009-2011 period alone, US’ exports to other APEC countries jumped by 45 percent. The US secretary of state Hillary Clinton sang an entirely new tune at Vladivostok: “Our growing economic interdependence is part of why I often say that much of the history of the 21st century will be written in Asia.” In fact, she travelled to Vladivostok via Beijing. However, while Moscow has faithfully stuck to the APEC’s mandate as a clearing house of economic issues, this may not be the case at next year’s summit, which the Philippines will host. Politics is almost certain to creep in. Philippines and China didn’t even have a “bilateral” on the sidelines of the Vladivostok summit. Meanwhile, Washington is also pushing for a Trans-Pacific Partnership (excluding both China and Russia), which may pose an existential challenge to the APEC. Beijing has already begun work to build a rival free-trade area of its own with Japan and South Korea to blunt the cutting edge of the Trans-Pacific Partnership. Also, yet another trading block idea, ASEAN+6 (including China, India, Japan, South Korea, Australia and New Zealand) is also surging, which would immediately become the world’s largest free-trade area if it comes to fruition. In short, there is a danger of the APEC dissolving into competing blocs as time passes and of never quite turning out to be the forum for the real trade talks. In many ways, the APEC summit that China will be hosting in 2014 becomes a defining moment.